According to Parish records from Holy Trinity Church, John and Mary Urbanski had 10 children. Of 10, only 2 girls and 2 boys survived to adulthood. Francis, Joe, Annie and Mitz were born , christened,communed, confessed and confirmed as Urbanskis. Suddenly, around 1915, they all became “Casters” an Americanized name, and a generic term describing John’s occupation at the time. The ugliness of anti-German sentiment had overtaken people’s everyday lives and had crept along the National Road and deep into Indianapolis. Suddenly, old street names like Germania were changed from German words and towns-names to more “appropriately” American ones like Belmont Avenue. Coinciding with the German hysteria, the KKK was recording its biggest membership surge since the days of the old South. Thus being Catholic, being immigrants, sounding German (colloquially called Hunkies ) while speaking their Slovene native tongue all became rather lowly and dangerous. Our family was among many who changed their surname to blend in. In those early years of the 20th century, being different or being “less” was both a social hindrance and potentially treacherous. Neighborhood assimilation centers were set up to help all children and adults learn to be more American and to turn their backs on the lives they had left behind in “the Old Country”. The Ku Klux Klan was deeply entrenched in the small counties ringing the big city of Indianapolis, and there was a simmering contempt for anyone or anything that may have been in allegiance with the Kaiser. John and Mary were raising their children in between the country folk to the west, and the eastward cultured city dwellers just across the White River bridge. Considered West Indianapolis at one time, their small neighborhood was now called Haughville named after the metals manufacturers plant located there by Haugh Brothers in the 1880’s. Soon Haugh’s foundry was joined by the modern refrigerated packing business Kingans and the immigrant workers flooded in to take the jobs and simple frame housing. They had been recruited and imported from their bergs and villages in places like Slovenia, Serbia, and Croatia. That’s how the Urbanskis had come to Indianapolis and that’s how they earned their daily wage too. Grandmother Mary saved every penny she could spare to buy up boarding houses. For years the parlor floor in the family’s own house was “bedded up” for newly arrived workers who needed temporary lodging. They had taken the long transatlantic ocean liner trip, paid in full by “the Company”, made a connection by train and found themselves in Haughville on John and Mary’s floor…working in the mill, or the packing house, renting a space on the floor to sleep on, and in turn, saving every penny they didn’t drink to bring their families over too. Joe wasn’t the oldest of the children, but he was probably the tallest at about 6′. He was athletic and tough,a simple and hard-working man who chain smoked and stirred cream and sugar into his coffee in ritualistic trance-like manner. 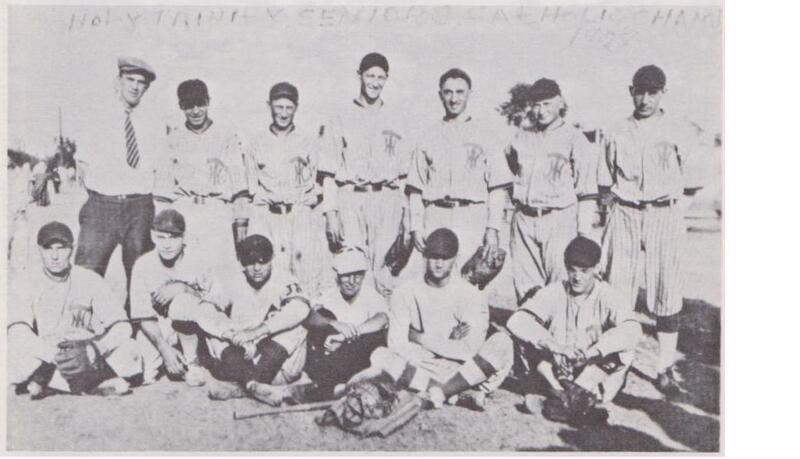 He played bush league baseball and was the big hitter on Holy Trinity’s men’s team. When he was 18, Joe was drafted into the army. When his hitch was up he joined again to serve in the place of his brother who was about be wed. I often wonder if he didn’t rejoin just for something bigger to do than spend his life running gutted pig carcasses from the slaughter hooks into the cold lockers at Kingans. After all, being big and strong, that’s likely where he would be headed for life. Note: he is the tallest in the center of the back row in the photo. I’ve heard a tale or two of Joe in his younger rougher days. Especially one about him and some buddies getting into a fist fight with some men from “somewhere else” passing by the corner tavern. All was regular Saturday night fun, when one of the outsiders added a 2×4 into the fray and started swinging. In Haughville it was considered “off-limits” to use weapons in a fist fight…a real sign of ungentlemanly behavior. By the time the cops arrived, the crowd had disbursed and a half-dozen guys were laid out neatly along the gutter. Bloody and semi-conscience the “strangers” were helped to their feet and sent on their way back toward the bridge. To the frustration of the officers, the tavern was filled with only law-abiding citizens enjoying an evening out. As a matter of fact, they were all having such a lovely time singing and carrying on, none had even noticed a ruckus outside on the steps. The interlopers never bothered to visit Haughville again… with or without their 2x4s . Joe discharged from the army after a couple of tours. He had spent most of his time driving big supply trucks across the swampy roads of the Philippine islands. Sometimes, at Grandpa’s he would start stirring his coffee and speaking about the giant black snakes… hundreds of them that would be all over the lonely roads at night when he was driving convoy. He talked of how they must have needed the heat left in the road to warm their cold blood at night. Sometimes he described the thumping sounds of them hitting the bottom of the big trucks. ” The sound never let up some nights, like all the snakes in the world were there in the Philippines.” I hung on every one of Joe’s words, and had the nightmares to prove it! Joe kept all the rentals as his investments. All of John and Mary’s kids were desperately frightened of being poor. Saving money and saving stuff (anything that could some day be useful to someone in the family) was always top priority for them. But he also worked for the Indiana University Medical School as a night watchman until he retired. A family joke (or maybe it was truer than others wanted to admit) went that Joe guarded the cadaver room for 30 years and didn’t have a clue what was in there. I mostly remember him as generally very quiet and reclusive. We saw him at Grandpa’s occasionally on weekends before he went in for a night shift. He would pull into the drive in his massive dirty ivory Plymouth Fury. His car windows were legendarily coated in an amberish vaseline-thick goo from years of collected cigarette smoke. If I saw him coming, I would run to the kitchen drawer where Grandpa kept Joe’s ashtray (it was like a beanbag on the bottom) and scurry to get a spoon out for his stirring. I delighted in watching him swirl the pale sugary coffee and cream soup he made in his cup. I listened to the funny old world way that he spoke (he held the accent and manner of speech of the old country that my Grandpa had worked so hard to erase from his own speech) and watched him punctuate sentences with his hands. Uncle Joe also had the largest nose I had ever seen on a person. It was just like Jimmy Durante…but since Jimmy was on tv and in movies he really didn’t count as a real person. Uncle Joe had a real-live Schnazola that was mercifully never passed on to the next generation. When he died years ago, it was as a “confirmed” bachelor. He is buried at the Catholic Cemetery,but I do not recall a mass for his funeral. After his retirement from the night watchman’s job, he really had little to do and fell into the staid habits of a reclusive old man. He must have had a heart attack and died without much suffering. He was found after lying dead alone in his home days later. Only his German Shepard dog was with him. I do love your family stories. Great story, I don’t know how I missed it. As I read your words I felt as if I was right there in the room with Joe. Great story! Loved reading this. Thank you for visiting our Photography Club website here in the North West of England, UK (Irwell Vale Photography Club), where I did a write up following a recent talk on family history. It is so important to know about our roots. It’s what makes us – and our children, and their children – who we are. Here in the UK we have had much excitement when the bones of King Richard III have been found buried under a public carpark. He is the last monarch to die in battle and was killed in 1485. His remains have been tested by DNA and found to be correct. In fact there is a living descendent – a gentleman who descended from Richard III’s sister. He is a furniture maker. Just imagine having that ancestory? This post reminds me that the city of Pittsburgh added an “h” at the end of the city’s name during the World War I era to make it look less like a German name (and more Scottish one). Such a great, yet sad, read. Here’s why I love history so much – the human face of racism, the cost of war, the love of family. My father only knew his grandparents as “Blaine” but they were always “Blair.” I think they Americanized it as well. Blair was just too danged Scottish for the puritanical Vermonters. Great read, really. So glad you’re putting this to the page. Every family needs a historian, a keeper of the stories. “Putrid Smell” – I’m glad that they changed it as well. Most of our name changes have been due to people not being able to pronounce it – interestingly enough, my Polish g-grandfather was in a mostly German neighborhood and the judge on his naturalization day suggested changing to to a German name! I guess you never know. How sad that a family of ten only had four making it into adulthood. Interesting reading, about the attitude towards Germans. My grandmother was born in 1905 in Ohio and had a very definite German name. I had never heard of any conflicts they had because of it. They did change the spelling of their name once but that was because there was another doctor in the same city with the same name. It was done so that patients wouldn’t go to the wrong doctor.